Today’s special is a step by step guide that reveals how you could be enjoying more traffic and more profits from video. If you’ve ever wished you could create videos to bring more traffic to your site, but were shy, or didn’t know how to do it, this is your opportunity to learn all of it for only $5. Video marketing is rapidly becoming extremely popular and very powerful. More and more people are watching videos online and using them to make their buying decisions. Are you benefiting from video traffic? If not, it’s time to take a look at Video Traffic Secrets now! Traffic and Leverage – Discover EXACTLY How A 7-Figure Internet Marketer Gets Free Traffic To His Sites! I don’t know about you, but challenges, especially public ones get results. Last month, Lynn Terry challenged all her Elite Members to an office clean up. I am very happy with my results for that challenge, so this month I am challenging myself publicly to increase traffic to this blog. How much? I am going to shoot for 75% increase in unique traffic (I was going to do 50%, but noticed I am on track for that anyway, so it wouldn’t stretch me too much). My blog is fairly new (only started it at the end of October last year), but already has a good number of daily visitors. This means, I need 2084 unique visitors in February in order to accomplish this challenge. 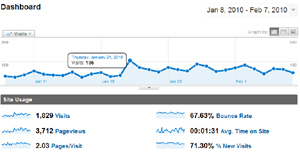 I need to get to work immediately, as I only have 379 unique visitors for February as of now, so I am way behind. I noticed that my daily visitors are dependent on my posting schedule: if I post, regularly, my visitor number grows exponentially. – post 5 times a week, no matter how hard that will be. I tend to write about 3 posts a week, but need to be more disciplined and post more. That’s yet for now. I’ll be back at the beginning of next month with my results. Do you need more traffic to your blog/site? Why not join me in this challenge? Let me know below if you’d like to join my challenge, and we can keep each other accountable.